"I either want less corruption, or more chance to participate in it." - Ashleigh Brilliant, 1933"
"Corruption is worse than prostitution. The latter might endanger the morals of an individual; the former invariably endangers the morals of the entire country." - Karl Kraus, 1874-1936." NOTE: The hearings on AFP corruption and the subsequent suicide of Gen. Angelo Reyes highlight the imperatives to relentlessly continue and persevere in the investigations of corruption in the AFP, especially in its higher echelons and their partners in recent administrations, from Ferdinand Marcos, through Cora Aquino, Fidel Ramos, Joseph Estrada and most recently that of former President Gloria-Macapagal-Arroyo. Our armed forces who are supposed to protect the native citizenry have turned into mini-centurions, mimicking the "generals and colonels" of Latin America and/or as "men with guns," and being influenced by their JUSMAG-training; latter historically tunnel-visioned by vehement anti-communism (which equates Filipino nationalism as communism) -- allowed by the creeping militarization of United States society (as warned by WW2 Allied commander General and later two-term U.S. President Dwight Eisenhower in his last/valedictory address). Thanks to this one legacy of the Marcos dictatorship, that of "taking care of the armed forces"-- a common practice among overt and covert dictators around the world -- to gain unquestioning loyalty from the military top brass, gross military corruption has now become a characteristic of our Philippine society. In our homeland, from the time of Marcos, we have come to witness so many "mistah" or "so-called officer and gentleman," turn into men who have enriched themselves by just being or having been soldiers!! [I grew up admiring PMA'ers - I have a much older first cousin from the late 1940s, I do not know how the newer breeds are seen since Marcos to now]. The case of Reyes may just be the tip of the iceberg, an instance of grave corruption, a tree in the forest of systemic corruption. Let us investigate and search for the truth and convict the guilty ones: Lt.. Gen. Ligot, Maj. Gen. Carlos Garcia, and the rest. But at the same time, let us take a deep and critical look to see the forest for the trees so that we native Filipinos can minimize, if not eliminate, abuses of power, i.e. thievery of public funds by military officers and their civilian counterparts. Thievery may kill a guilty few, but as a consequence of the selfish and anti-nationalistic action by these officer-thieves, their grand corruption has been killing --through deprivation-- so many more of our poor, hungry and sick native Filipinos. The below article by the late Capt. Rene Jarque tells us to do exactly that: to examine the AFP, its reason and purpose for being, its relation to "the people," its source of power, its relation to the civilian government in our Republic, etc. PS. Use Google Search if details on the case/events of Gen. Angelo Reyes are sought. Given the sad realities and dire straits of the native Filipino majority in the homeland, it is a rare occasion that we see a few individuals who may give us hope that the lights are not completely out. It is often frustrating and maddening to read or hear columnists, soldiers, politicians, businessmen, churchmen, etc. automatically, like parrots, charge and label those who speak out against the government and for the people as all "communists," etc. inadvertently implying that only communists really care for the ordinary man. That's how regressive, anachronistic and stunted our Filipino thinking is. Anyway, Here's an article by Capt. Rene Jarque, one of these few --obviously non-communist-- who speaks out; a relatively, young ex-military (PMA/West Point Class 1986) officer. UPDATE: I found this news shockingly sad and an enormous loss to the homeland: minutes after posting this one, a relative emailed to say that former Captain Rene N. Jarque had a cardiac arrest last August 19, 2005 in Jakarta (he was to turn 41 in October). We seem to have only a "few good men" and for some reason, the homeland loses them. We wonder why them? In this period of uncertainty, it is time for the armed forces, as the protector and defender of the people, to play a constructive role so that the nation can alter course with the right leaders and build a true democratic society so the people may have a firm hope in the future. The ideals of democracy state that the Army stands for the people and not just the privileged few. However, political reality dictates that the Army is really of the constituted government. In our country, the government is the privileged few and their network of relatives and patrons. What then if the policies and actions of government do not coincide with the common aspirations and general welfare of the people. Should soldiers be guided by their collective conscience or by their strict military oath to obey their civilian leaders as embodied in the Constitution they have sworn to defend, in the same way the Centurions obeyed their decadent emperors, the way the Wehrmacht blindly obeyed Hitler? Sixteen years after, that question is still very much relevant. Today, there is tremendous disenchantment with government and the public is in a restive mood. The economy is hobbling along burdened by poverty, foreign debt, high fuel prices, inflation, unemployment, budget deficit and uncontrolled population growth. Peace and order is unsteady with insurgency, terrorism and criminality. Corruption scandals plague the presidency and the military. Her Excellency is being accused of cheating in the last election and her spin doctors are taking the people for a ride in a circus of lies and deception. Our country today is being bamboozled by a discredited, crippled and insecure government which does not seem to have a clue, cannot get its act together and lacks the strength of character to lead the nation out of its misery. There is a crisis in national leadership and the people are confused and demoralized. Once again, we are careening into political turmoil that threatens our fragile democracy. To some, the situation is ripe for a change in government and as such, there are calls for a “revolutionary government” and rumors of destabilization plots and coup d’etat abound. In this time of uncertainty and discontent, what should the military do? What should be its role? Should it intervene as in 1986 and 2001? Fr. Joaquin Bernas calls the first provision the “civilian authority clause” and explains that civilian authority is essentially the “supremacy of the law” and a soldier renounces political ambition when he subordinates himself to civilian authority. He calls the second provision the “mark of sovereignty” implying the professionalism which should be inherent in the armed forces as guardians of the majesty of the law. 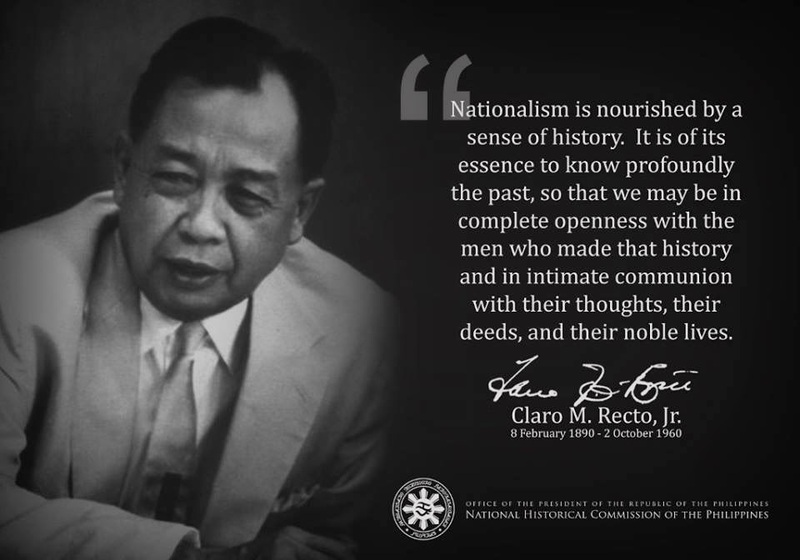 Marcelo H. Del Pilar also said something to the same effect: “Insurrection is the last remedy, especially when the people have acquired the belief that peaceful means to secure remedies for evils prove futile”. Indeed, what if the government turns out that it cheated in the elections? What if the supposedly legitimate government no longer reflects the commonweal, is going against its own people and uses the so-called majesty of the law to hide its corruption and flaunt its powers? If the armed forces continues to protect such government, can we can say that the armed forces is no longer acting as the guardian of the people? What if the armed forces no longer finds “nobility, dignity and honor” in being the guardian? Our experience in 2001 shows that the Constitution can be conveniently discarded to suit the situation. In other words, the majesty of the law can be ignored to cater to those in power or seeking power without the people’s mandate. In the end, the only justification for rebellion or the extra-constitutional takeover of government is victory. If one fails, he is charged with rebellion and sent to jail. From a constitutional point of view, the AFP leadership in EDSA Dos (i.e., people’s uprising in 2001) was clearly unprofessional. They mutinied against their commander-in-chief who represented a great majority of the Filipino people and they gravely undermined the Constitution. Consciously or unconsciously, the generals preserved the military’s power using a loud and powerful minority as cover against the silent and weak majority. Since there has been no real change in governance and only change in personalities, the action of the AFP leadership in 2001 was misguided and self-serving. They were desperadoes who merely enabled the trade of one set of crooks and nincompoops for another. The military’s interventionism in government has created a three-way political power structure in the classic Clausewitzian model composed of people, government and the military. And today, between an inept government and a corrupt military, the people are getting screwed. Church activism in recent years has probably made it four-sided, adding a confusing spiritual element. The separation of politics and military is a notable feature of western democracies that was rammed down our throats by the Americans. I think it is time that we question this framework and look at alternative models of governance wherein the military plays a productive role in government and in the development of Philippine democracy. The power of the government is only as good as it is identified with the good of the polity. What if the government has failed in promoting the common welfare and has committed illegal acts? What if the country is heading towards disaster? Should the armed forces stand idle, detached from politics, and allow the politicians to destroy the country? In a situation of political uncertainty and chaos, what role should the military play? What should it do? Let me attempt to answer these questions by first drawing a simple, rough model showing the relationship of three variables: government, military professionalism and level of intervention. Let’s call this the GPI graph. a. There is a direct relationship between how good government is to the level of professionalism in the military. Good government means a professional military and conversely, a professional military implies good government. b. There is an inverse relationship between the level of professionalism and the level of military intervention. As professionalism increases, the inclination to intervene decreases. c. There is also an inverse relationship between how good government is and the level of military intervention. As government gets better, the likelihood of intervention decreases. From these relationships, I see three kinds of roles for the armed forces – passive, constructive and interventionist – depending on the political and military situation. Government is unstable. Democratic institutions existing but not strong. General political situation is filled with uncertainty. Armed Forces is semi-professional or undergoing reforms. It prudently intervenes in government but does not take over. It acts as a guardian of the people by being a deterrent to bad government and helps build democratic institutions. Government is weak or illegitimate. Democratic institutions are weak. Peace and order has broken down and violence may have erupted. General political situation is volatile. Armed Forces is unprofessional or professionalism is low. It takes over government and takes a direct role in politics through a military government, a military-sponsored government or a civilian government that is beholden to the military. For the situation today, I believe the armed forces should play the constructive role. It is a balanced role wherein it does not stand idle or directly take over government. It is neither indifferent nor destructive. In this role, the armed forces acts within the framework of the Constitution and as a counterweight to an ineffective government of unruly and corrupt politicians to achieve political stability. Further, it acts as catalyst for improving governance and a force for nation-building. If war is too complex to be left to the generals, governance is even more complex to be left alone to the politicians, especially the irresponsible and corrupt. As a crucial stakeholder in governance and society, the armed forces should use its powers and capabilities for the common good, to deter bad government and promote democracy and development. If the AFP can use its intelligence capabilities to monitor the movements of rebel groups, it can use the same to monitor the activities of corrupt politicians and generals. If it can keep an eye on suspected destabilizers, why can it not check a President or any politician who is cheating an election? Our soldiers are actually very experienced in this constructive role. The military strategy against insurgency calls for winning the hearts and minds of the people in the countryside. In doing so, the soldiers become involved in the political, economic and social life of the community. When I was the commander of a remote detachment in San Mariano, Isabela, a major part of our counter-insurgency effort was community projects. My soldiers and I were involved in backyard beautification and cleanliness, medical civic action and building toilets and classrooms. I advised the barangay leaders on how to manage the village. Before my unit was transferred, we were talking about cooperatives, markets and farm-to-market roads. Through this exposure to the community and seeing the failure of government, our soldiers undergo a subtle process of politicization that has made them sensitive to the political life of the nation. The participation of junior officers in the coup attempts and in the mutiny at Oakwood in 2004 is largely because of this politicized view. This constructive role can be elevated to a higher level wherein the armed forces strengthens governance and democratic institutions. In the 2004 elections, for example, I wrote to the AFP Chief of Staff exhorting him to play this constructive role by disallowing and evicting all organizations that use military camps for their political pronouncements and sending a public warning to politicians, including the President, that any violence, cheating or fraud will not be tolerated by the AFP and that candidates cannot use AFP personnel, equipment and funds for the campaign. It was, of course, too much to expect. In relation to the corruption case filed against Maj. Gen. Carlos Garcia, the Chief of Staff can order the AFP finance office to open all documentary evidence. For the jueteng (an illegal numbers game) scandal, military intelligence is more than capable of gathering evidence to confirm the claims of the witnesses in the Senate hearing. As to Gloria-gate (allegedly wiretapped conversations between the President and an Election Commissioner), the AFP has the resources to confirm the authenticity of the purported wiretapped conversation.Indeed, if the AFP is convinced that the President has committed improper or illegal acts, it can quietly send her a message to do what is right for the good of the country or lose its support. Two factors will inhibit the effectiveness of a constructive role: lack of credibility and a generally anti-people armed forces. First, the AFP has lost so much credibility with the corruption scandals involving active and retired officers. The Oakwood mutiny showed a deep crack in the system, a fault line in the AFP leadership. It does not have credible and trustworthy leaders, not even among the ex-generals who may use the armed forces for their own ends. The Officer Corps has lost its moral compass and is fragmented. Two inherent risks of this constructive role are the potential abuse of power and unwarranted intervention. Power tends to feed on itself, if uncontrolled, until it becomes so corrupted that a turn-around is very difficult. The experience during martial law all too clearly showed the ill-effects of an overreaching military which has lost touch with itself and the people. It became greedy, corrupt and abusive. To protect itself and perpetuate its power, the armed forces can needlessly intervene using convenient even contrived excuses. To minimize these risks, the armed forces should seek a balance with the people and must always analyze the overarching implications of its actions to society and act with the common good in mind. But let’s be honest. The armed forces can take over government anytime it chooses and we cannot really do much about it. Sure, there will be condemnation from certain groups and the international community. There will be protests and demonstrations but in the end, if the armed forces persists and it is united, there is not much the people can do against guns and tanks. If it intervenes in a time of political uncertainty, such intervention will most likely be gladly accepted by the people. How long the people can tolerate a military or military-sponsored government will depend on how it is able to govern and fulfills people’s expectations. If unable to do so, there are already existing insurgent organizations throughout the country that can serve as a nucleus for armed rebellion. Military intervention is a mere power-grab if it only results in a change of personalities in government and there is no real structural change in society, particularly in the equitable distribution of political and economic power. A constructive, professional armed forces serves as a buttress to democracy and the Constitution. It serves as the guardian of democratic processes while ensuring that it does not abuse its own power. It uplifts democracy by strengthening the pillars of governance. It will not allow an irresponsible and corrupt government to govern. By being professional, it can pull or catalyze the government and the bureaucracy to become better. Truly, the crucial challenge for the armed forces is how to rebuild itself to a professional and mature organization. The first imperative is professionalizing the Officer Corps which is the foundation of professionalism in the AFP and the driving force for sustained reform. Among the younger members of the corps, there is an inherent desire to change. Professionalization efforts should nurture this desire by opening up channels for constructive criticism and initiating affirmative action. There must be an organized effort mobilizing the Officer Corps to awaken the generals from their collective self-denial that nothing is wrong with the AFP and to push the chain of command to initiate painful but necessary changes, especially the creation of a performance and merit-based system in promotions and assignments which will ensure that only those who are competent and honest go up. Another key target is the non-commissioned officer corps. If the officers are the brain, the corporals and sergeants form the workforce or backbone of the armed forces. Besides people, the armed forces should develop efficient, effective and ethical management systems in personnel, procurement, logistics and finance incorporating best practices and new information technology. Corruption through conversion, construction and commissions should be eradicated.It should formulate doctrine – how it should fight – and not use foreign, especially American, formulations which are alien to us. Part of rebuilding is upgrading capabilities to become a multifunctional force capable of dealing with a variety of military and non-military missions (search and rescue during natural disasters; evacuation of non-combatants like OFWs from disaster or war zones; and developmental activities such as building roads and bridges). Procurement should look into multi-functional platforms, i.e., planes the provide close air support in battle and also deliver emergency medical supplies to remote areas, patrol boats that can also provide medical services to coastal barangays, trucks that can provide covering fire and also evacuate people during floods. Rebuilding will not be easy and it becomes even more difficult as the armed forces has to also deal with security threats and concerns. Besides political necessity, the security environment is another important reason why the armed forces must rebuild and professionalize. Allow me to divert a bit and briefly explain these security challenges so we can appreciate the enormous challenge facing the armed faces as it struggles to reform as well as perform. Instead of alienating the insurgents, the government should reach out and engage them, understand their plight, initiate confidence- and trust-building measures and resolve the matter peacefully. The approach must be holistic as a major factor in insurgency is the absence of government in the remote areas where the rebels are strong. All government agencies should be involved in delivering basic services to the people. However, in my experience,there is this “plan-implementation gap” and government services are non-existent or not felt very much in the countryside. The military alone is not capable and its main task is to contain the violence and make the area peaceful and secure so that government can deliver the services to the people. In Asia, China’s emergence as an economic and military power alongside Japan is changing the regional security landscape. Likewise, old flash-points still exist – territorial claims, tensions in the Taiwan straits and Korean peninsula. Erstwhile security concerns like maritime piracy, trafficking of drugs and humans and money laundering have become more sophisticated because of global interconnections and new technologies. In this new environment, the armed forces should rethink its strategy and outlook of defense-military alliances. We should perhaps explore closer defense and military links with emerging powers such as China and India and strengthen relations with neighboring countries in Southeast Asia. These alliances will provide the first line of defense and give us breathing space as we rebuild our national defense. We should likewise develop a self-reliant defense posture to design strategies and indigenous military technology so we can defend ourselves using our limited resources and also maintain our national self-respect by not depending too much on other countries for our defense requirements (VFA, JUSMAG, etc - Bert). This twin challenge of rebuilding and dealing with security concerns will take a lot of the AFP’s organizational strength. Change will question age-old perceptions and established norms. It will pit people against one another with regard to ideas, concepts and approaches. There will be tremendous resistance to change. The existing command structure and social order will be disrupted and challenged. However, with the right combination of commitment, organization, leadership and management, the challenge can be met. The armed forces must hold firm, stay united and keep its eyes on the objectives in order to accomplish the mission to change. We pride ourselves as a democratic nation. But our democracy is a sham as politicians manipulate the system to perpetuate themselves in power. How can we even think that we have a democracy when elections, the very soul of democracy, is being perverted by the very public officials who should protect the sanctity of the ballot. Democracy is also not just all about having elections or a Constitution. It is also about having the active and sustained participation of the people through democratic institutions like barangay assemblies, people’s organizations, trade unions and political parties. The armed forces can play a constructive role by safeguarding the elections from fraud and by promoting peoples organizations rather than spying on them. Democracy is also not just the freedom to vote or the freedom of speech or religious freedom. It is also about being able to live with pride and dignity. It is also about economic freedom enabling the practice of these rights. How can one vote if he cannot afford to go to the polling station? How can one practice his religion when he cannot afford to go to church or has to commit sin to feed his family? How can one practice free speech if he cannot even read the newspaper? The government must be able to improve people’s lives so they can exercise their freedoms. The armed forces can play a constructive role in preserving these freedoms by educating the people of their rights and responsibilities as citizens for nation building and engaging in developmental activities to support the national program for economic development. Ngayon, nagtitimbang na naman ang mamamayan. Hindi natin alam kung saan talaga tutungo ngunit nararamdaman natin na kailangang magbago ng landas para sa kapakanan na ating bayan. Alam din natin na hindi nararapat ang mga tiwaling pinuno sa pamahalaan, na kapag hinayaan natin sila ay wala tayong matatanaw na magandang kinabukasan. Alam natin na kailangan ng ating bayan ng mga pinuno na magaling, matatag at mapagkakatiwalaan. Subalit hindi na tayo nakakasiguro kung sino sa mga pinuno ngayon ang nararapat. 1. Jarque, Jose Rene, “Metamorphosis of Idealism”, Army Journal, June 1991. 2. Bernas, Joaquin, in a speech entitled “Supremacy of Law and Mark of Sovereignty”, delivered during the Annual Convention and General Membership Meeting of the Philippine Military Academy Alumni Association on 22 Jan 2005. Published in The Cavalier, March-April 2005. 3. David, Randy in a speech, “The Philippine Army Through the Years” delivered during the Philippine Army Senior Leaders Conference, March 2005. 6. Barnett, Thomas P.M., The Pentagon’s New Map: War and Peace in the 21st Century, Berkley Books, New York: 2004. 7. Almonte, Jose, former National Security Adviser, speaking at the Asia-Pacific Security Conference, as reported in the Philippine Star, Feb 24, 2004. Permission is granted to reprint or redistribute this article, provided its author/s and Bulatlat are properly credited. A nation that continues year after year to spend more money on military defense than on programs of social uplift is approaching spiritual death.” – Martin Luther King, Jr. THE FILIPINO MIND blog contains 541 published postings you can view, as of December 20, 2012. Go to the sidebar to search Past & Related Postings, click LABEL [number in parenthesis = total of related postings]; or use the GOOGLE SEARCH at the sidebar using key words [labels, or tags] for topics of interest to you. OR click a bottom label or tag to open related topics.